Citation: Hasana H, Desalegn E. Characterization and Quantification of Phenolic Compounds from Leaf of Agarista salicifolia. Herb Med. 2017, 3:1. In the practice of traditional medicine, people have made use of the active compounds from various plants in the form of medicine, to cure diseases. In fact, Ethiopia has about 6,000-7,500 plant species and among them many have been claimed to possess medicinal properties. These medicinal plants have always been associated with cultural behavior and traditional knowledge. Due to a better cultural acceptability, better compatibility with human body and low toxicity and low persistence in the environment , it needs for scientific validation of these useful medicinal plants is very essential. Among traditional medicinal plant, A. salicifolia is tropical plants that found in Ethiopia especial highland region of Sidaama Zone. Phytochemical constituents of A. salicifolia revealed the presence of tannins, alkaloids, cardiac glycosides, anthocyanin, steroids, polyphenols and terpenoids, . These compounds play a major role to protect animals and human being against diseases and potential for development as successful pest control agents [3-5]. Moreover, phenolic compounds are one of plant secondary metabolites, which play important roles in disease resistance [6-13], protection against pests and species dissemination. The use of insecticidal activities of plants is especially prevalent in developing countries, where plants grown locally (which are renewable resources) are cheaper for subsistence farmers to use than synthetic chemical pesticides. Proper characterization, identification and quantification of phenolic compounds are important, because a specific compound may contribute with specific health benefits . However, only a few of these plants, especially those containing phenolic compounds have been used as sources of bioinsecticides. But no data has been reported for phenolic compounds from the leaf extract of A. salicifolia. Therefore, the present study was used to characterize and quantify phenolic compounds from A. salicifolia plant leaves by using LC-MS, UV-Visible and FT-IR spectrometric techniques. Fresh and healthy leaves of the A. salicifolia plants were collected from natural forest of Rumudaamo kebele in Arbegona Woreda near the Logita River, Sidaama Zone, Southern Ethiopia. Identification and voucher specimens of NHB 001 of the plant were prepared and deposited at the National Herbarium, Department of Biology, Addis Ababa University. Fresh and healthy leaves of the A. salicifolia were washed with tap water to remove sand, dust, and other contaminants, then air dried at Department of Chemistry laboratory, HCTE for two weeks ensuring sufficient air flow to avoid damping. Dried plant leaves were crushed to powder by using an electric grinder (FM100 model, China) at a speed of 6000 rpm for 60 s at the Department of Animal Science, Hawassa University. The extract was prepared by dissolving 1 g of the fine powder sample separately in 10 mL of ethanol. The contents were kept in orbital shaker for 6 h at room temperature. Thereafter, the extract was filtered using Whatman no. 1 filter paper and evaporated to dryness under vacuum at 40°C by using a rotary evaporator (Buchi, 3000 series, Switzerland). The extraction was done in triplicate and the resulting extract was dissolved in 2 mL ethanol and stored in a sealed plastic container at 20°C until further investigation. Following extraction samples were sonicated (model 750D, VWR Intl. Ltd., Montreal, QC, Canada) for 1 min and then centrifuged (model Durafuge 300, Precision Scientific, Richmond, VA, USA) at 5000 rpm for 15 min. Then the supernatant was filtered through 0.2 cm syringe filters prior to the chromatography analysis. LC-MS analysis: Separation and identification of phenolic compounds were carried out by using HPLC coupled to electrospray ionization and triple quadrupole mass spectrometry (LC-MS) as described in . The analyses of phenolic compounds in the extracts were performed using a Waters Alliance 2695 separations module (Waters, Milford, MA, USA) coupled with a Micromass Quattro micro API MS/MS system and controlled with Mass Lynx V4.0 data analysis system (Micromass, Cary, NC, USA). Electrospray ionization in negative ion mode was used in the multiple reaction mode of mass spectrometric analysis. The column used was an Allure biphenyl (100 mm × 2.1 mm) (Restek Chromatography Products, Bellefonte, PA, USA). For the separation of the flavonol, phenolic acid and, aliphatic organic acids, the mobile phase consisted of 0.1% formic acid in water (solvent A) and 0.1% formic acid in acetonitrile (solvent B) at a flow rate of 0.35 mL/min. A linear gradient profile was used with the following proportions of solvent A applied at time t (min); (t, A%): (0, 94%), (2, 83.5%), (2.61, 83%), (2.17, 82.5%), (3.63, 82.5%), (4.08, 81.5%), (4.76, 80%), (6.75, 20%), (8.75, 94%), 12, 94%). The retention time of each compound was compared with the retention time of the standards in different mobile phases. The peaks, showing the same retention time as that of the standards, were preliminary identified and were further analyzed by MS. The MS was used to get the molecular weights of the compounds by scanning from 50 to 1500 m/z. Obtained results were expressed in μg per g of dry weight (dw), as mean ± standard deviation of three independent analyses. For the estimation of absorption edge of the as-extracted sample, UV-Visible diffuse absorption was measured using SP65 spectrophotometer (Shimadzu, UV-1800) at Addis Ababa University research laboratory. As-extracted sample was dissolved in hot methanol then the UV-Visible diffuse absorbance of the solution was recorded at 250 to 800 nm range to determine the characteristic peaks of the extracted sample. As-extracted powder was characterized by using FT-IR (SHIMIDAZU) instrument at Addis Ababa University research laboratory. Ten mg (dry mass) of the sample was thoroughly mixed with 100 mg (dry mass) of KBr and ground to a fine powder. A transparent disc was formed by applying a pressure in moisture-free atmosphere. The IR absorption spectrum was recorded between 400- 4000 cm-1. Identification and quantification of phenolic compounds from leaf extract of A. salicifolia was analyzed by LC-MS analysis, and obtained data of the retention time, identification and individual quantification and the molecular mass of each molecule and a main fragment resulted from MS data [M-H]+, expressed in m/z were presented in Table 1. Analyzed result shows that presence of phenolic acid, flavonoid and catchin compounds. Phenolic acids and flavanol compounds were one of the most abundant compounds in extracted plant samples. From these four different phenolic acids were observed from the plant samples. These include chlorogenic acid, isoferulic acid, cafeic acid and ferulic acid. From the calibration curv e results, amounts of phenolic acids like chlorogenic acid, isoferulic acid, cafeic acid and ferulic acid was calculated as 279.23 ± 28.75, 22.67 ± 1.98, 6.85 ± 1.25 and 9.90 ± 0.31 μg/gDW from ethanol extract respectively. As a result from total phenolic acid, highest amount of chlorogenic acid (279.23 ± 28.75 μg/gDW) was observed. Similarly six flavonoid compounds such as, quercetin galactoside, quercetin glucoside, quercetin arabinoglue, quercetin rhamnoside, quercetin and quercetin rutinoside were observed. From the calibration curve results, the amounts of quercetin galactoside, quercetin glucoside, quercetin arabinoglue, quercetin rhamnoside, quercetin and quercetin rutinoside was calculated as 46.15 ± 3.48, 28.63 ± 2.50, 1.32 ± 0.10, 97.24 ± 4.07, 58.97 ± 3.71 and 0.46 ± 0.02 μg/gDW from ethanol extract respectively. From total flavonoid compounds, the highest amount of quercetin rhamnoside acid (97.24 ± 4.07 μg/gDW) was observed. Also five catechins compounds such as, EGC, catechin, epicatechin, EGCG and ECG were observed. From the calibration curve results, the amounts of EGC, catechin, epicatechin, and ECG were calculated as 2.58 ± 0.46, 11.14 ± 6.66, 304.57 ± 20.88 and 0.07 ± 0.03 μg/gDW from ethanol extract respectively. From the calibration curve results, highest amounts of epicatechin acid (304.57 ± 20.88 μg/mg) were observed. Similarly, other two phenolic compounds such as phloridzin and phloritin were observed. From the calibration curve results, the amounts of phloridzin and phloritin were calculated as 6.6812 and 0.3802 μg/gDW from ethanol extract respectively. Table 1: Retention time (Rt), mass spectral data, relative abundances of fragment ions, identification and quantification for analyses of phenolic compounds in plant leaves using LC-MS Detection. The UV-VIS profile of plant extract was taken at the 250 to 800 nm wavelength due to the sharpness of the peaks and proper baseline. The UV-visible spectra were performed to identify the compounds containing σ- bonds, π-bonds, and lone pair of electrons, chromophores and aromatic rings. The profile showed the peaks at 278 nm, 410 nm, 505 nm, 535 nm, 610 nm and 671 nm as presented in Figure 1. Occurrence of peaks at 278-671 nm reveals the presents of phenolic acid, flavonol and alkaloids in the A. salicifolia ethanol extract plant leaf. On comparison of the spectra of leaves with literature value, shows that the extract has some similar alkaloid, flavonoids, and flavonol compounds as reported in Ref. [16-18]. Figure 1: UV-Visible spectra of isolated A. salicifolia plant leaves from ethanol extract. The FTIR spectrum was used to identify the functional groups of the active components present in extract sample based on the peaks values in the region of IR radiation. 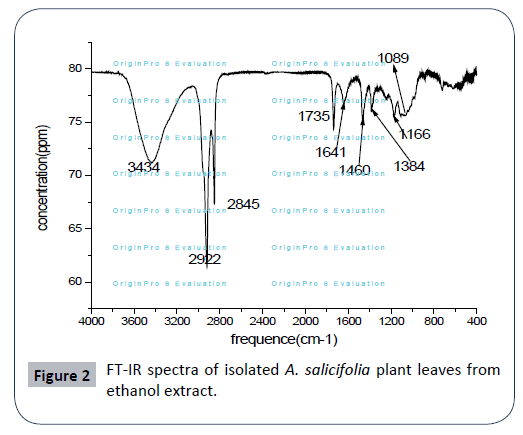 As a result FT-IR analysis shows that the presence of various functional groups in ethanol extract of A. salicifolia with various peaks as presented in Figure 2. The broad band at 3334 cm-1 is corresponding to OH- group which confirm the presence of phenolic compounds in leaf extract, absorption band at 2922 cm-1 and 2859 cm-1 indicates C-H stretch in methyl (–CH3) and methylene (–CH2) aliphatic saturated (C–H) sharp asymmetric and symmetric stretching. The C=O stretching is observed at 1735 cm-1; it is due to the presence of carbonyl group. Band at 1641 cm-1 shows the presence of aromatic ring (C=C). The peak at 1460 cm-1 indicates CH2 bending vibration of alkane. Peaks at 1384 cm-1 indicate C-H stretch in alkane group. Band observed at 1089 cm-1 is C-H stretch. Peaks at 1166 cm-1 confirms the presence of C=O polysaccharide. The above infrared functional group characteristics were cited in literature [19- 22]. Thus, FT-IR spectrum confirmed the presence of phenols, amino acids, amides, carboxylic acids, alkanes, aliphatic esters,secondary alcohols and mono substituted alkenes in leaf ethanol extract of A. salicifolia. Figure 2: FT-IR spectra of isolated A. salicifolia plant leaves from ethanol extract. The findings indicate the importance of traditional knowledge in science. Quantitative analysis showed that an appreciable amount of total phenolic acid (318.65 ± 32.29 μg/mg) and total flavanol compounds (318.36 ± 28.03 μg/mg) were observed from ethanol leaf extract of A. salicifolia. Comparing the fragment ion m/z with literature value, fragment ion m/z at 305 indicates that epigallocatechin and catichin and epicatichin compounds with [M-H-] at m/z 289, which is similar with reported data in extracted Ribes nigrum L. plant leaves . Neo chlorogenic acid, quercetin, quercetin rutinoside, quercetin galactoside and quercetin glucoside were identified with [M-H-] at m/z 353, 301, 609 and 463 respectively. These data are agreement with previous results reported for different plant leaf extract of Ribes nigrum L. , Cistus ladanifer  and Cornus mas and Crataegus monogyna . Literature survey has revealed that plant metabolites like phenolic compounds (simple phenols, phenolic acids, flavonoids, catechins etc.,) play an important role in many of the activities like wound healing, analgesic, anti-inflammatory, anti-oxidant, insecticidal and antimicrobial activity [26,27]. Due to the great structural variety of flavonoids and phenolic acids and their presence as complex mixtures in medicinal plants, their qualitative and quantitative phytochemical characterization requires sensitive and reliable analytical methods. Therefore, LCMS is the method of choice for phenolic analysis, since it provides a powerful, robust, versatile and available technique. Therefore, this shows that ethanol extract are from the toxicological point of view much safer and therefore more suitable for the industry than the other organic solvents. On the basis of ethanol extract of A. salicifolia plants leaves for identification, quantification and characterization of phenolic compounds were successful analyzed. As a result, total 17 major phenolic compounds were identified in the plant leaves. LC-MS method was developed for simultaneous quantification of several derivatives of phenolic acid, flavonols and flavonoids with good resolution and identification of the bio activities. Similarly spectophotometric analyses also agree with observed data. Overall result shows that plant have full of secondary metabolites. The presence of these constituents may be one of the contributing factors responsible for the activities by virtue of their different properties like anti oxidant, anti inflammatory, analgesic, insecticidal and antimicrobial activities. Since the phenolic compounds have been interest of health benefits, the present analytical study could be a potential application to identify and quantify the phenolic compounds in this plant. We are grateful to Hawassa College of Teacher Education for financial support and for providing artichokes. Githinji CW, Kokwaro JO (1994) Ethnomedicinal study of major species in the family Labiatae from Kenya. J Ethnopharmacol 39: 197-203. Haile Hasana L (2015) Natural insecticides and phytochemical analysis of gaggassa (Agarista salicifolia) plant leaves against brown banded cockroach. J Medic Plt Res 9: 1111-1117. Hana Hashim M (2012) Insecticidal Effect of Different Plant Extracts against Tribolium confusum (du val) (Coleoptera: Tenebrionidae). J Agr Sci and Tech 2: 1175-1181. Farnsworth NR, Henry LK, Voboda GH, Blomster RN, Yates MJ, et al. (1966) Biological and phytochemical evaluation of plants. I. biological test procedures and results from two hundred accessions. Lloydia 29: 01-122. Abayomi S (1993) Historical review of Traditional Medicine in Africa. Spectrum Book Ltd, Ibadan, pp: 9-25. Wink M (1993) Production and application of phytochemicals from agricultural rspective. Phyt Agri Cla Press, Oxford, UK, pp: 171-213. Bisht SS, Kamal R (1994) Garlic extract: An antifungal treatment for the control of storage of apple. Proc Nat Acad India 64: 233-234. Babu R, Murugan K (1998) Interactive effect of neem seed kerna and neem gum extract on the control of Culex quinquefasciatus Say. Neem Newslette 15: 9-11. Venketachalam MR, Jebasan A (2001) Repellent activity of Ferronia elephantum Corr, (Rutaceae) leaf extract against Aedes aegypti. Biores Technol 76: 287-288. EShaalan AS, Canyonb D, Younesc MWF, Abdel-Wahaba H, Mansoura AH (2005) A review of Botanical Phytochemicals with Mosquitocidal Potential. Environ Int 3: 1149-1166. Servili M, Montedoro G (2002) Contribution of phenolic compounds in virgin olive oil quality. European. J Lipid Sci Tech 104: 602-613. Antolovich M, Prenzler P, Robards K, Ryan D (2000) Sample preparation in the determination of phenolic compounds in fruits. Analyst 125: 989-1009. Silva S, Gomes L, Leitão F, Coelho AV, Vilas Boas L (2006) Phenolic Compounds and Antioxidant Activity of Oleaeuropaea L. Fruits and Leaves. Food Sci Tech Int 12: 385-396. Naira N, Karvekar MD (2010) Isolation of phenolic compounds from the methanolic extract of Tectona grandis. Res J Phar Bio Chem Sci 1: 221-225. Rupasinghe HPV, Erkan N, Yasmin A (2010) Antioxidant protection of Eicosapentaenoic acid and fish oil oxidation by polyphenolic-enriched apple skin extract. J Agric Food Chem 58: 1233-1239. Michalak A (2006) Phenolic Compounds and Their Antioxidant Activity in Plants Growing under Heavy Metal Stress. Polish J of Environ Stud 15: 523-530. Sahaya Sathish S, Janakiraman N, Johnson M (2012) Phytochemical Analysis of Vitex altissima L. using UV-VIS, FTIR and GC-MS. Int J Phar Scie Drug Reser 4: 56-62. Niara Moura P, Lima de Barrosb Y, Ionaldo Diniz Basílio JL, Maria de Fátima A (2016) Microscopic and UV/Vis spectrophotometric characterization of Cissampelos pareira of Brazil and Africa. Revista Brasileira de Farmacognosia 26: 135-146. Ranjana S, Vijay DM (2015) FTIR studies and spectrophotometric analysis of natural antioxidants, polyphenols and flavonoids in Abutilon indicum (Linn) Sweet leaf extract. J Chem Pha Res 7: 205-211. John C (2000) Interpretation of Infrared Spectra. In: A practical approach. Encyclopedia of Analytical Chemistry. John Wiley and Son Ltd., pp: 10815-10837. Saranya D, Sekar J (2016) GC-MS and FT-IR Analyses of Ethylacetate Leaf extract of Abutilon indicum (L.) Sweet. Int J Adv Res Biol Sci 3: 193-197. Kashem LA, Rabiul IM (2006) Condensation reaction of benzyl with resorcinol and the establishment of the spectral data as well as cytotoxicity study. Bangladesh J Pharmacol 1: 58-63. Meenakshi S, Manicka GD, Tamil MS, Arumugam M, Balasubramanian T (2009) Total flavonoid and invitro antioxidant activity of two seaweeds of Rameshwaram coast. Gl J Phgy 3: 59-62. Lillian Barrosa B, Montserrat Due N, Carlos Tiago A, Sónia Silva C, Mariana Henriquesc, et al. (2013) Antifungal Activity and Detailed Chemical Characterization Of Cistus Ladanifer phenolic Extracts. Indus Crop Prod 41: 41-45. Ponniah Senthil M, Govindan Sadasivam S (2015) Identification and Quantification of Phytocompounds In Acalypha Indica Leaves. Int J Pharm Bio Sci 6: 11-21.